Lebensborn ("the Fount of Life") was established in Munich, Germany on 12 Dec 1935 as an officially registered Nazi Party organization under the jurisdiction of the Schutzstaffel, or the SS. The racially-motivated program, partially also a response to the declining birth rate in Germany, provided housing and care for pregnant wives of SS members, unmarried mothers, and orphans. The first facility opened in 1936 at the village of Steinhöring near Munich. aid for racially and biologically-hereditarily valuable families. the accommodation of racially and biologically-hereditarily valuable mothers in appropriate homes, etc. In 1938, Lebensborn was transferred to an office under the direction of SS-Standartenführer Max Sollmann and SS-Oberführer Dr. Gregor Ebner, who answered directly to Himmler. By 1939, membership reached 8,000. Members of the program typically received the best healthcare available, and the mothers and children were well fed until the final days of the war. As Germany began conquering neighboring nations, the Lebensborn program also expanded, with the first facility outside of Germany being established in Norway in 1941, though expansion did not significantly reach areas outside of Germany, Norway, and Poland. The establishment of facilities in Poland eventually introduced a new aim for the program, which was to Germanize young Polish children who displayed genetic traits that the Nazi Party members considered to be superior, ie. "Aryan". Many of these Polish children were forcefully taken away from their Polish parents, some by Lebensborn personnel and some by others not associated with the organization. 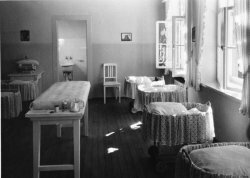 In the conquered nations, Lebensborn facilities also served as a refuge for some of the women who fraternized with Germans and became pregnant, who would otherwise be ostracized. The study of Lebensborn records after the war revealed that about 8,000 children were born in Lebensborn facilities in Germany, 8,000 in Norway, and fewer in other countries. 250 of the Norwegian children born into the Lebensborn program were adopted by German families; all but 80 of them were brought back to Norway after the war. I am author of NO TIME FOR FEAR, VOICES OF AMERICAN MILITARY NURSES IN WORLD WAR II, which contains oral histories of nurses who served all over the world. The 'SS Babies' are mentioned by a nurse who saw the place in Germany afte the war was over. When I researched it, references were that German girls were selected to have babies by SS so that the race would get more pure. Also saw where it was mentioned when Eugenics was written about - that some babies were euthanized when they didn't come up to standards in these places. It has been a long time and I don't have the notes from those references. It is already tells a lot of nonsense! Lebensborn was a facility where women who gave birth to illegitimate children, they were able to give anonymously. Not more. My wife is trying to verify her dad was a member of the lebonsborn team. His name is Helge Robert Berntsen born in 1941. Are there any records? Born in 1945 With a father from Germany and a Norwegian mother. My fathers name is on my birth certificate: Heinz Meigler or Meidler. What do I do to find out of the Family? My father is 72 years old. He was born in Holzminden and in his birth certificate in the place of father name NN is written . My grandmother was Polish moved there to work. My father is deeply troubled by that fact and I, his daughter would like to know more about it. 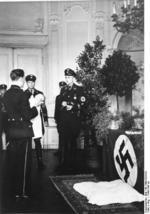 It seems that children born through Lebensborn program had NN in their birth certificates. Is it possible to find any documents about identity of people involved in this program? Unfortunately, my grandma never wanted to talk about it and she passed away this year.